I’m not sure where time has gone, but it sure has flown by. I am trying to capture all my moments and memories, but it seems that my life has come to a point where everything is fleeting, like a hummingbird. But I can’t. I won’t know how to operate if I had to sit still and plod along taking things slowly one bit at a time. Sure, I would be able to live in the moment, but man, I would go crazy as things would be too mundane. I like to do a lot of things at the same time. I can often be heard telling people to kill two birds with one stone. In fact, it’s one of my many mantras at work. Write one policy for the business? Why, when I can write 3 targeted policies at once and churn out a strategy/business case at one go? BAM, killing two birds (or 4) with one stone. Be part of a band? Sure! I’ll play the drums and be the lead singer too! BAM! Two birds with one stone. 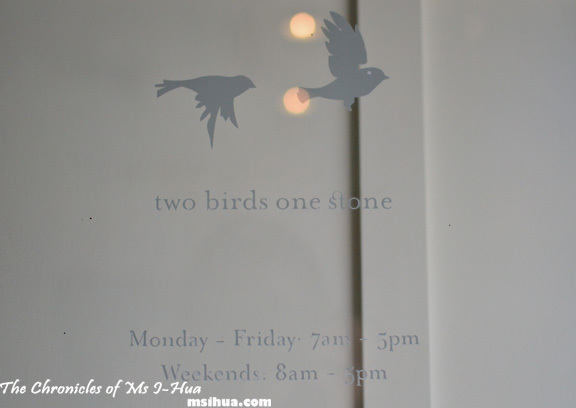 So when the Boy said on Sunday, “Would you like to go to this new cafe in South Yarra called Two Birds One Stone?”, it was as if the penny had dropped and the universe was giving me a sign! Incidentally, anyone read about the asteroid passing the earth on Sunday? 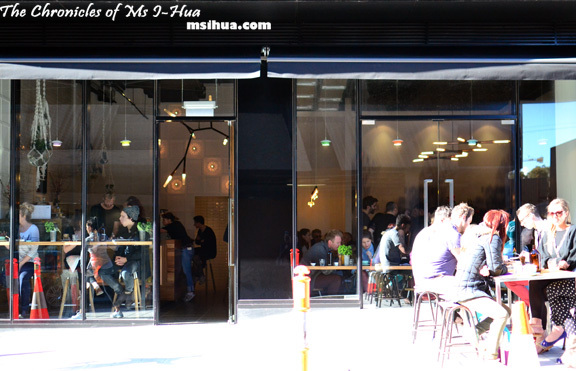 So we flitted down to South Yarra, we couldn’t help but moaned out loud as we saw a crowd had gathered around the entrance of the establishment, spilling onto the street even. I loved the decor and fell in love with the elegant hanging glass potted plants. They were beautiful. With a simple straightforward coffee menu, much the same as at Patricia Coffee Brewers, the choices of single origins and coffee blends are up on the board with choices of white, black or filter. Original? Not quite. Taste wise, not bad. With a custom made four-group Synesso machine, the barista crew churns out a steady stream of coffees for the crowd. 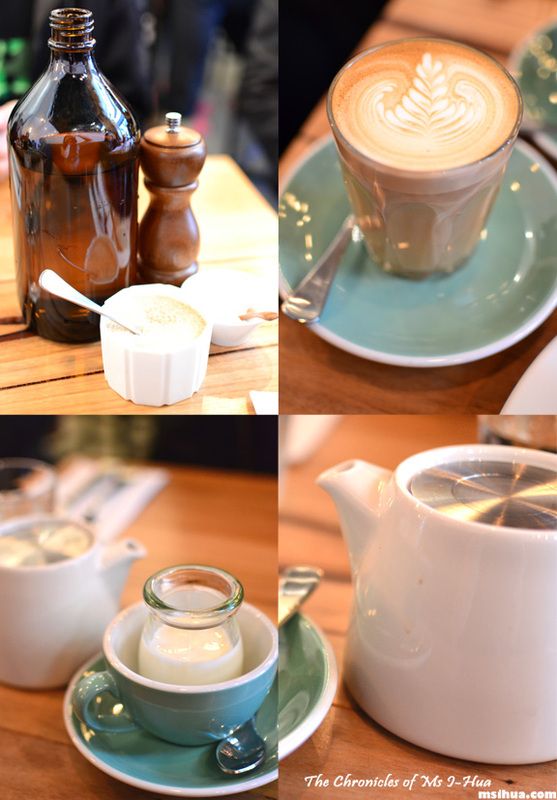 I had my usual Latte (House Blend) ($3.80) & the Boy went ahead with his usual order of English Breakfast Tea ($4.00). 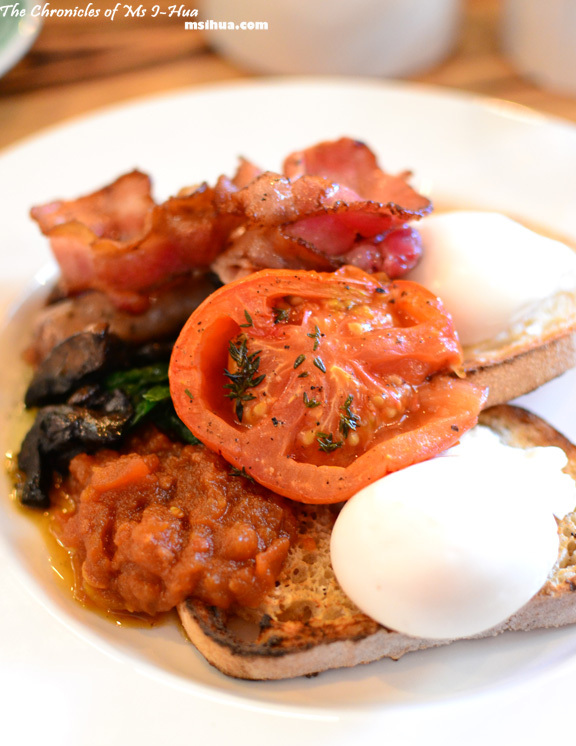 Two Birds ($18.50) – Eggs, Bacon, Tomato, Pork Chilli & Fennel Sausage, Mushrooms, Spinach and Tomato Relish (from the Breakfast section). I could only ever choose from two birds or one stone (the big breakfast vego style of eggs, mushrooms, avocado, spinach, haloumi, house smoked corn & tomato relish), but I obviously couldn’t go past the bacon and the sausage. I am only a carnivore after all 😛 The pork chilli & fennel sausage certainly had a kick to it and as I wasn’t expecting it, it caused me to gasp a bit. Loved it! The eggs were perfectly poached as you can see from the #eggporn #yolkporn picture I put up on my instagram which generated quite a lot of chirping amongst my followers (see what I did there?). The Boy had the Salt Cod & Potato Fritter with Spinach, Poached Egg, Caper Berry Dressing ($17.50) (from the Lunch section) and said it was a delight. The oozy yolk from the perfectly poached egg, the creaminess (inside) and crunchiness (outside) from the fritters, and the sourness from the caper berries all went well together. I especially (after stealing a bite) loved the little bits of salt cod that came through in each mouthful. Such a wonderful balance of flavours! 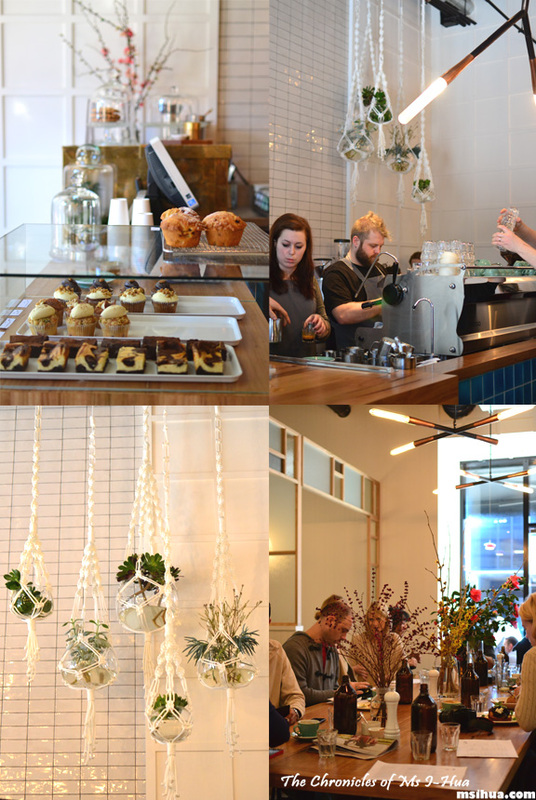 Being the new kid on the block is always going to generate a lot of hype, more so when it is one of the worthwhile cafes to visit whilst at fancy South Yarra. My top tip. Be there early. Away from the masses as they take in the winter chill and sleep in on the weekends. That being said, it certainly was worth the 20 minute wait in the cold wind (with no shelter) last weekend. awesome breakfast, 5 min drive away from home, gosh what am i waiting for? I love the restaurant and the food. Those hanging glass potted plants are so beautiful. The decoration and arrangement are all well arranged. thanks for sharing your experienced with this restaurant at south yarra. I want those pots for my home! Those glass potted plants are so cute! Love your pictures, but meh, so hungry now and want yummeh brunch! Go now and get some! That better have been a Disney band, missy. I like the look of their poached eggs, so smooth looking… clingwrap technique I guess? It did look like that with the lined top bits but it was awesome! That is how you end up with a mouth full 😛 GEDDIT? Love how smooth the poached eggs are! I just wanted to eat it whole! Go early! You wake early! 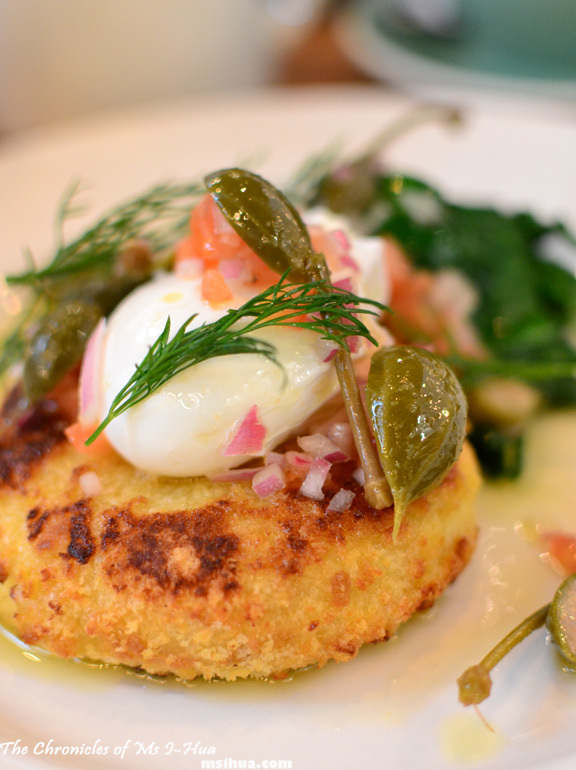 It does look cute indeed, and the salt cod fritter sounds delicious! It was… the salt burst was yum! Adrian (Food Rehab) recently posted…Cookbook Newsflash: Landing in Amazon.com Best Sellers, New Stockists + WIN 1 of 4 copies! You guys should go on Tuesday! I know.. it never ends! I keep finding them! 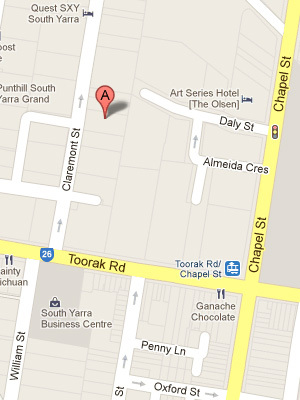 I’ve heard heaps of good things about this place and going by your blog, so has everyone else on this side of Melbourne! Awesome! Will try to go there next weekend! I’m assuming they don’t take bookings. What time did you get there last time? We are planning to go this coming Sunday but I’m definitely no early bird. Around 11 or 11.30am? It wasn’t too bad a wait but that depends on the weather! There must be a third wave backlash with all the “simple” coffee menus popping up. I quite like the offering at Market Lane; it’s a little fancy but the menu guides you though. Also; “mmmm” to that chilli fennel sausage! I like bit of a kick. There must be! It’s everywhere I go now!